Dark chocolate benefits your health in many ways. Yes!! Scientists have finally discovered what we have known for a long time...This "candy" really is good for you!! The health benefits of chocolate can protect the heart, increase blood flow in the arteries, lower blood pressure, and lower bad cholesterol. It isn’t just “good” for you...the right kind of chocolate can be just what the doctor ordered. Naturally high in flavonoids – organic compounds that stimulate antioxidant activity – healthy chocolate can protect the heart, increase blood flow in the arteries, lower blood pressure and even help to combat cancer. The health benefits of chocolate provide an antidepressant effect. : Eating chocolate stimulates the release of mood-affecting chemicals such as endorphins, phenyl ethylamine and serotonin. These feel good chemicals may also explain why women crave chocolate when they are suffering from PMS. Serotonin levels often drop in the days before menstruation begins, so eating chocolate can help boost those levels and improve one’s mood. 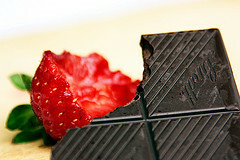 Read this very informative article about dark chocolate benefits. ANTI-INFLAMMATORY: This wonderful substance is rich in flavonoids, which are a group of chemical compounds that occur naturally in certain fruits, vegetables, teas, seeds, nuts and roots. Most flavonoids have some anti-oxidant properties, meaning that they help prevent cell damage that can lead to cancer and other diseases. Some flavonoids also have anti-inflammatory properties. 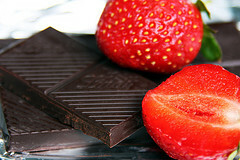 CHOCK-FULL OF ANTIOXIDANTS: Cocoa beans – the primary building block of chocolate - are a rich source of antioxidants. Specifically, they contain flavonoids, antioxidants found in various plants that work to protect the body from damaging effects of free radicals…the cause of disease and aging. LOWERS BLOOD PRESSURE: Dark chocolate benefits your cardiovascular system by improving blood pressure. Researchers compared the blood pressure-lowering effects of cocoa and tea in previously published studies and found eating cocoa-rich foods was associated with an average 4.7-point lower systolic blood pressure (the top number in a blood pressure reading) and 2.8-point lower diastolic blood pressure (the bottom number). Read the rest of this interesting article on "lowering blood pressure". CONTAINS GOOD NUTRIENTS : The cocoa bean is rich in vitamins B1, B2, and D, as well as the essential minerals magnesium and iron. IMPROVES INSULIN SENSITIVITY : See this amazing article on diabetes where the measurement of sensitivity (predisposition to diabetes) was improved in the patients in the study. AIDS IN WEIGHT LOSS: Surprisingly, dark chocolate benefits weight loss. It contains phytonutrients called polyphenols. These are natural antioxidants and anti-inflammatory molecules that cool off inflammation and can help protect you against obesity. This wonderful food is also rich in MUFAs(monounsaturated fatty acids)-the solution to belly fat. Want to know what to look for when buying dark chocolate? What it should have and shouldn’t have to be considered "Healthy"? Learn more about antioxidant rich foods on this informative site. Bert tells you why antioxidants are do important to our well being. It is now a scientifically proven fact that the health benefits of chocolate are real, not just something we have been hoping for. Return to the Home Page"